In 1981, Cessna began work on a next-generation "bushplane", designed for hauling passengers and cargo under austere conditions. The initial idea was to mate a turboprop engine to the Model 206 Skywagon, but result didn't have adequate range; a new design was required. After hiring on two consultants who had been with de Havilland Canada, maker of popular bushplanes like the Beaver, Otter, and Twin Otter, Cessna came up with the "Model 208 Caravan" -- a single-engine turboprop machine with a high wing, fixed tricycle landing gear, a boxy fuselage that could accommodate three-abreast seating, and a large cargo door. The first Model 208 prototype performed its initial flight on 9 December 1982. The first production Caravan was rolled out in August 1984. It was powered by a single Pratt & Whitney Canada (PWC) PT6A-114 turboprop engine providing 448 kW (600 SHP) and driving a McCauley three-bladed reversible propeller. Sales of the initial Model 208 were modest at first, until FedEx entered into discussions with Cessna to build a Caravan variant optimized for the parcel business. The result was the "Model 208A Cargomaster", which was a pure cargolifter, with the passenger windows and left rear door deleted, plus a large cargo pannier fitted to the belly. It also featured an increase in tail height by 15 centimeters (6 inches), longer engine exhausts to keep hot exhaust gases off the pannier, and Bendix-King avionics. FedEx ordered 177 Cargomasters, and the Caravan series took off. The Model 208A proved highly reliable and easy to maintain. FedEx liked the Cargomaster so much that the company then ordered a derivative with higher load capacity, the "Model 208B Super Cargomaster", which featured a 1.22 meter (4 foot) fuselage stretch, obtained by inserting plugs fore and aft of the wing, and a more powerful PT6A-114A turboprop engine with 503 kW (675 SHP). Load was increased to 1,590 kilograms (3,500 pounds). Initial flight of the first Super Cargomaster was on 3 March 1986, with deliveries later in that same year. 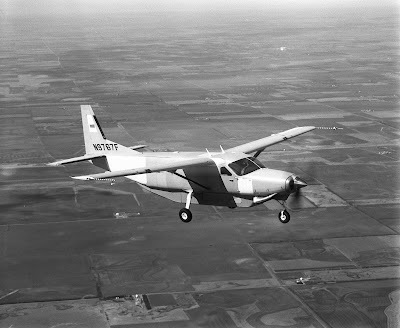 The Super Cargomaster led in turn to a similarly stretched version of the Caravan, the "Model 208B Grand Caravan", with windows and a quick-change cabin capable of carrying 14 passengers or freight. The Garmin G1000 glass cockpit was fitted in production from 2008. The latest version, the "Grand Caravan EX", was introduced in 2012. It features a PT6A-140 engine with 647 kW (867 SHP) that provides excellent "hot and high" performance, the aircraft also featuring updated avionics. Over 2,500 Caravans have been sold to date.